Most TV adverts drive me nuts. They tend to be very irritating and painfully unsubtle. Like most people I would imagine, I just mentally tune them out (if not fast forward/Tivo them). The agencies that are commissioned to create them appear to be idea vacuums as they constantly plagiarise each other or steal the latest idea from innovative movies. The fact that these people are called creatives rather than pretentious thieves is beyond irony. And oblong glasses don't make you look clever, they make you look like a cliche. Anyway - it is always the exception that proves the rule - and this is superb. The folks at Cadbury (sorry, don't know who their agency is) have created this piece of genius (clicky). "We realize that the Gorilla is sitting in front of a massive drum kit. One of those Eighties big kits with loads of things to hit. Loads of tom-toms, hi-hats, double bass drum, etc. We know that the best drum solo in the whole history of rock - ever - is coming. The Gorilla knows it too. The Gorilla hits the drums with passion and vigour. Elegance meets power. He's phenomenal on the drums - feeling every beat. The camera leaves the ape and his drum kit in the studio." And what had a Gorilla drumming along to Phil Collins got to do with chocolate? Well as it says on the site "There's no clever science behind it - it's just an effort to make you smile". Which is of course all the more delightful because there is a lot of clever science behind it. It may be brilliantly funny, but it doesn't have it's own viral web site by accident does it! 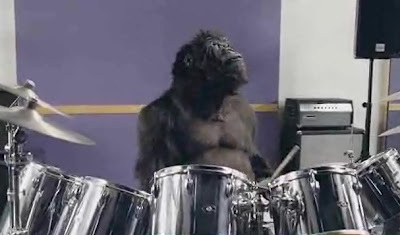 Also, when the gorilla is playing he looks quite a bit like Neil the drummer in my band Sideburner. I normally don't leave comments on blogs, however. AWESOME! This is a great video clip.